Volbella is a new injectable treatment approved by the FDA for long-term correction of fine lines around the mouth. It uses proven, safe Vycross technology to double the duration of other fine-line correctors, providing results that last up to one year*. 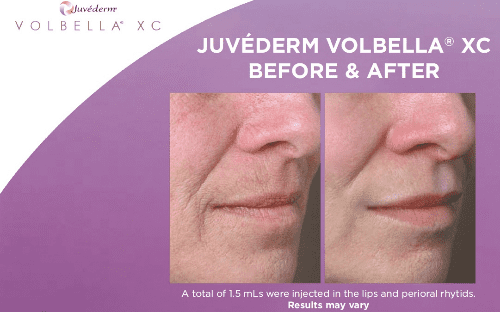 In clinical trials, Juvederm Volbella was found to effectively increase lip fullness and soften the appearance of lines around the mouth in a majority of subjects through one year. In a single comfortable treatment, Volbella uses an injectable filler based on hyaluronic acid (HA) that provides a desirable improvement in the lip contour, boosting volume, smoothing vertical creases (smoker’s lines), and achieving symmetry. Volbella lip injections are recommended for a smoother, softer consistency that mimics the natural feel of your lips. We’ve seen what it can do, and we can’t wait to give our patients the smooth, long-lasting results they’ve been asking for. The team of medical professionals at Remedy were among the first in the country to perform this treatment, and we’re consistently ranked by Allergan, the manufacturer of Volbella, in their top 80 practices of over 35,000 nationwide. Call Remedy today to learn more about this breakthrough product and to schedule your appointment.